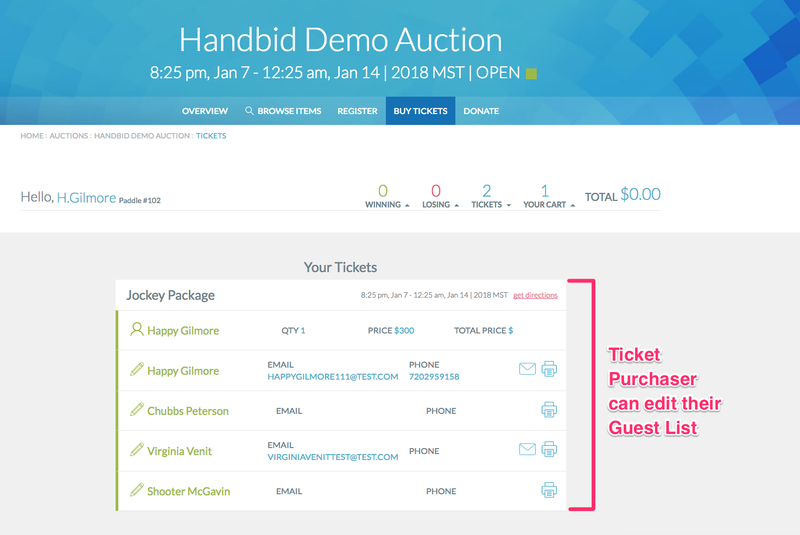 Jan 8, 2018: Handbid launches new Guest List manager and Ticketing upgrades. We're excited to announce new features in Handbid that we're sure you'll love: A NEW GuestList Manager, upgraded Ticketing system, and a ton of other new features and improvements to the platform! This is a huge new system in Handbid that will allow you to manage your list of Guests (Who's Coming) and also checkin those guests (regardless of whether they register to bid). Managers can view and manage guests based on sponsor, table, etc. Building upon the current Handbid ticketing system, we have added a number of improvements and integrated it into the new Guestlist. Managers can now purchase tickets (and apply discount codes) directly from the auction manager. Bidders can now purchase tickets, apply discount codes, and manage their guest list directly from the apps or the web. Future releases will allow for mass invitations via the GuestList, tracking of RSVPs, and automated checkin at the door with barcode scanners. Stay tuned for updates on that! Want to get a personalized tour of Handbid? If you have any questions about the Handbid GuestList or our want to schedule a demo, please reach out to us by clicking on the link below.